I can’t get enough of persimmons, I lovelovelove them. It’s the perfect fruit and I start the day by mixing it into my muesli, actually it is more persimmons than muesli. Lately I discovered other ways to use them as well, like in cakes. Put the butter in a baking tin with the star anise and the clove. Put it in the oven until the butter is melted; swirl the star anise and clove through the butter so it can take the flavors. Take the clove out and leave the star in the middle. 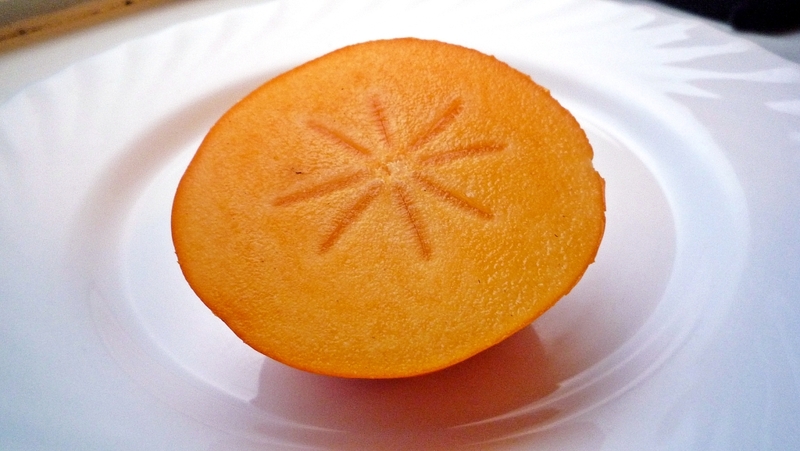 Cut the persimmons in slices, not to thin. 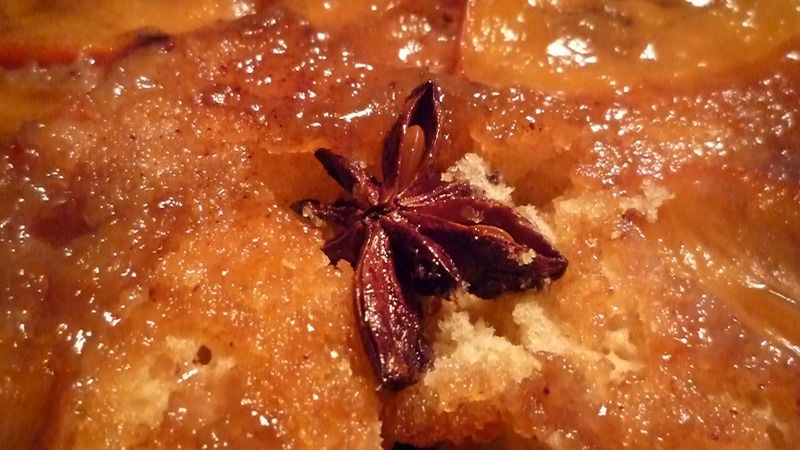 Sprinkle the caster sugar evenly over the bottom of the tin and put the slices of persimmons on top in a nice pattern. I made a sun around the star anise and used the left over’s to make a circle at the edge. Split the eggs, combine the egg yolk, cane sugar, lemon zest and 4 tablespoons of lemon juice and mix together vigorously. Beat the egg white cloudy with a pinch of salt until you can keep the bowl upside down and not get it on your head. Mix the egg yolk with the flour until everything is combined. Add ¼ of the egg white and mix together so the batter will become a bit thinner, now add the remaining egg white in 3 times and fold it into the batter. When everything is combined; pour the mixture over the fruit and put in the oven. Bake for about 25-30 minutes, when a wooden pick comes out clean, it’s done. Serve upside down. Preheat the oven to 170C/ 340F. Grease a cake tin. Mix the flour, baking powder, baking soda, salt lime zest and chocolate in a bowl. In another bowl mix the honey, oil, egg, yogurt, lime juice, sugar until it comes nicely together. Add the liquid to the flour and combine into a smooth mixture. Pour this mixture in the cake tin and bake for 20 to 25 minutes, check if the cake is done, when a skewer comes out clean it’s ready. Take the cake out of the oven; let it stand for 5 minutes then take it out of the tin and let it cool down on a rack. When cooled down, sift some icing sugar on top and cut in dices. Preheat the oven to 180C / 360F. Clean the Brussel Sprouts by cutting the ends and remove the dirty outside leaves. Wash and cut them in two or four when they are big. Try to find the small ones because with these the leaves are packed very tightly together, and they will stay together when you cut them, the big ones will fall apart. Heat some oil in the pan and bake the sprouts on a medium fire. Cut the garlic and shallot small and toss them together with the Sprouts. Bake until the Sprouts are tender. Combine the flower, baking soda, baking powder, Old Amsterdam, pepper and salt. Mix in another cup the eggs, oil, cream and the milk. Add the liquid to the flour and stir until you have a smooth mixture. Add a handful of cashew nuts and the Brussel Sprouts with the garlic and onion. 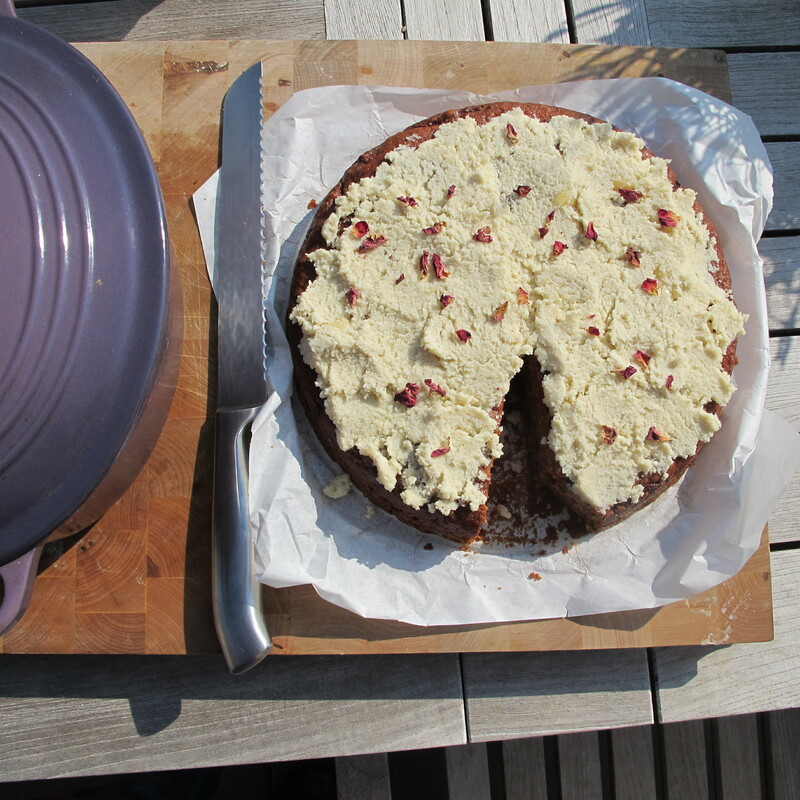 Pour the mixture in a well greased cake tin, sprinkle some old Amsterdam on top and bake for about 30 minutes in the oven. Start with putting the yeast and sugar in 100 ml luke warm water, set it aside until the yeast tries to crawl out of your cup, about 5 to 10 minutes. In a wide bowl mix the flour, salt and rosemary. Make a well in the middle and enter two tablespoons of olive oil. Add the yeast mixture in the well too and start stirring carefully with a wooden spoon, constantly nibbling some flour from the sides of the well with your spoon. When you can’t handle it with the spoon any more, change to working with your hands. Knead in all your energy, aggression and love; knead, push and flip it over until the dough is soft, elastic and still a little bit sticky about 5 to 10 minutes. If it is so sticky you can’t get it from your hands, add some flour, is it to dry, add some water. Note that it is always easier to add some extra flour than extra water. Now cover the dough in some olive oil, put it back into the bowl and cover the bowl with a damp cloth. Try to find a nice and warm spot in the house to let it rise for about one hour or until doubled in size. Take the dough out of the bowl and punch the air out of it; fold it a couple of times but make sure the seams will be at the bottom of your bread, this shouldn’t take more than 2 or 3 minutes. You can make it in any shape you like, just make sure it’s not too high, say about two centimeters. Brush a baking tray with oil and put the bread on it. Cover it with the damp cloth and let it rise again until doubled in size. In this second rise you can go back to it twice to push the dough down a bit with the tips of your fingers. This will give it the holes which also add to the focaccia look. This rise is very important; the air that forms in this rise will stay in the bread and make the bread soft. Preheat the oven to 220C. Drizzle some olive oil on the bread; it will find its way into the holes. Now put the bread in the oven, be very gentle, and don’t slam the oven door on it. After 5 minutes turn the heat to 190C and bake until golden brown, for about 15 minutes. When you take it out of the oven, wait a little until you take it from the tray, it can stick, but will be easily removed when cooled down a bit. Let it cool down further on a rack. Take a wide pan and put the balsamico in it. Add a splash of red wine (about 4 tablespoons), a cardamom pod, the date syrup and some fresh grinded black pepper. Let it bubble and reduce just a little. Cut the figs in 4 or 6 parts depending on the size. Put them cut side down in the pan and let the fluids reduce some more. It will caramelize a bit due to the syrup but don’t make it to thick; it will serve as your salad dressing as well. Wash, dry and cut the spinach, add the figs, crumble some goat cheese, sprinkle the sunflower seeds and voila! 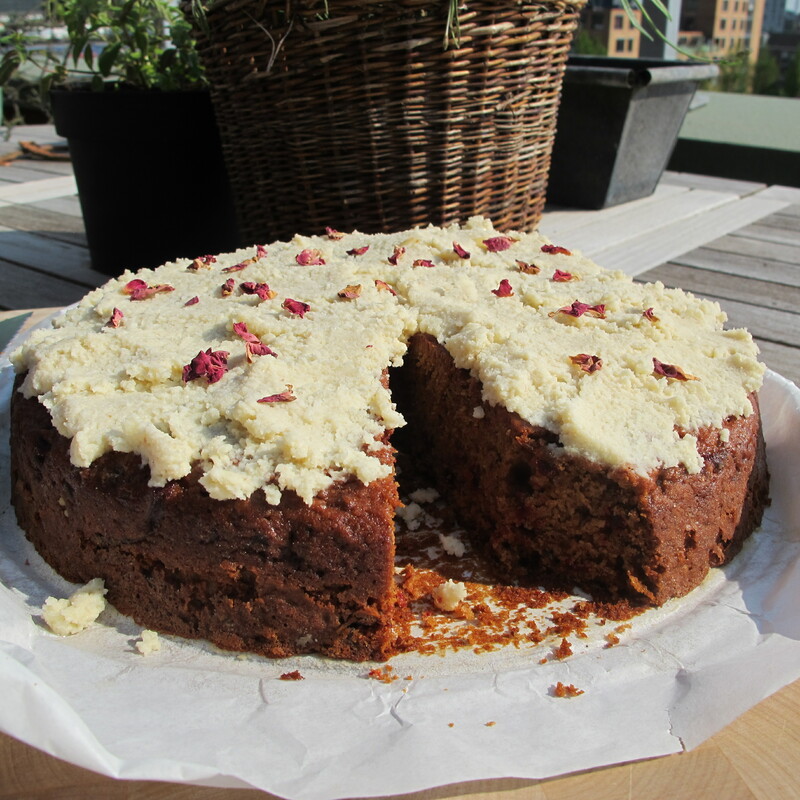 If you have some dates and figs left, try this date and fig cake. Cut the figs and the dates in half. Mix the flour, the almond powder, bicarbonate of soda, baking powder and lemon zest in a bowl. Separate the egg yolks from the white. Mix the egg yolks with the sugar until the mixture becomes creamy and light. Mix this with the flour, milk, lemon juice until smooth. Put the butter in the cake tin and put it in the oven. When the butter is melted, take it out of the oven and evenly sprinkle the brown caster sugar in the tin, add the figs, cut side down in the tin and the dates cut side up. Put back in the oven for 5 minutes. Mix the egg whites with the salt until foamy; carefully fold the egg whites in the flour mixture. Try to handle it as little as possible so the mixture stays light. Take the tin out of the oven and pour the mixture on top. Put it back in the oven for about 30 minutes or until a toothpick comes out clean. When ready let it stand in the tin for 5 minutes, now turn up side down on a rack to let it cool further. The hardest part of making this cake is waiting until it cooled down. Of course we did not manage to do so and warm it is also delicious; but it is best when the chocolate is completely hard. Using the entire orange including the peel gives the tart an incredible rich orange flavor and I like to think that it also keeps some vitamins, or am I just kidding myself? Boil the oranges in water with a teaspoon of orange blossom for 1 hour. Preheat the oven to 160 C/ 320F. Take a round cake form about 24 cm/10 inch diameter; grease it with butter and dust it with flour. Puree the whole oranges, peel and all, in a kitchen machine with the whipping cream until almost smooth. Separate the eggs and mix the egg yolks, sugar and vanilla sugar until light and creamy; now add the orange puree and the Greek yogurt and mix well. Bit by bit sift the flour with baking powder and bicarbonate of soda over the mixture and mix until all is incorporated in the mixture. Beat the egg whites until cloudy (you have to be able to turn the bowl upside down without the egg white gliding out). Carefully fold the egg whites into the mixture. Pour the mixture in the form and bake for about one hour or until a toothpick comes out clean. When the tart is cooling down, melt 200 grams of pure chocolate ‘ au bain-marie’ with half a spoon of butter and poor it over the tart. Let the chocolate cool down in the fridge.